Essentially, use our website, it’s the only place we actually trust. That’s where the other piece comes in. DCist’s Tom Lee wrote a great piece on Google & Metro last week, including some behind the screens conversations between himself and WMATA folks about this very issue. His analysis is top drawer and needs to be read in full, but comes down to: WMATA needs Money to make this a good idea. The figure bandied about by other publications is approximately $68,000. Which may sound like a lot, but in the grander scheme of things, it’s probably not. Great work, Tom, this was a great piece to read. Thanks for the kind words, Tom! I’m sympathetic to everyone’s frustration at what certainly *looks* like WMATA dragging its heels and/or deciding they can out-Google Google. 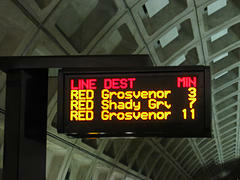 I’m still optimistic that we’ll get Google Transit in DC in the near future, though. Next up: the return of NextBus. I think what gets my goat is the way this has all been publicly-handled. This isn’t about liability, it’s about money. If it’s really about money, then say it’s about money. It just looks like WMATA is hiding behind their lawyers saying “We don’ wanna!” and that’s what gets my goat about the whole thing.